"Whatever we once thought Nature was—wildness, God, a simple place free from human thumbprints, or an intricate machinery sustaining life on Earth—we have now given it a kick that will change it forever. Humanity has stepped across a threshold. 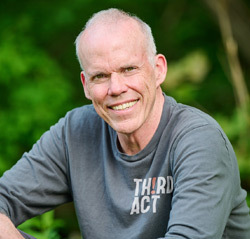 In his free-ranging and provocative book, Bill McKibben explores the philosophies and technologies that have brought us here, and he shows how final a crossing we have made." "McKibben's eye-opening plea . 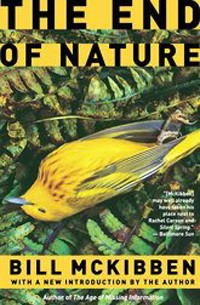 . . is likely to prove as important as Rachel Carson's classic Silent Spring or Jonathan Schell's The Fate of the Earth. The End of Nature may convert you, or it may infuriate you. But the world will never again look the same to you after you've read it." "Bill McKibben's subject is the end of nature itself, which he claims humans have brought about. The subject is important, the notion is arresting, and Mr. McKibben argues convincingly." "Bill McKibben's The End of Nature deals with humanity's effect on our natural environment the same way that Jonathan Schell's Fate of the Earth presented the harsh facts of the potential nuclear destruction of life. Both books left me better informed, deeply saddened and wondering if the human species has too much natural ability to dominate (each other and our environment) without the wisdom to use such abilities for the promotion of life." —Christine Peringer, "Peace and Environment News"